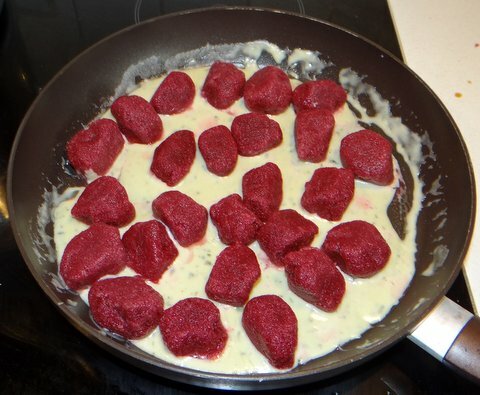 After a less than fully satisfactory first attempt last week at making beetroot gnocchi that did not turn out as ‘beetrooty’ as I had wanted, my second attempt was a success! 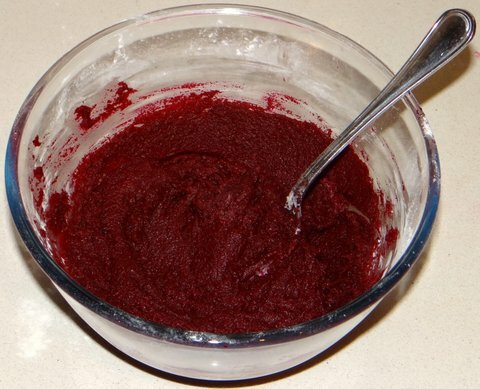 More beetroot flavor with a simpler recipe. I served them with a gorgonzola sauce. To make the beetroot flavor stand out even more, you could serve them with a lighter sauce. The combination with gorgonzola works well, though. 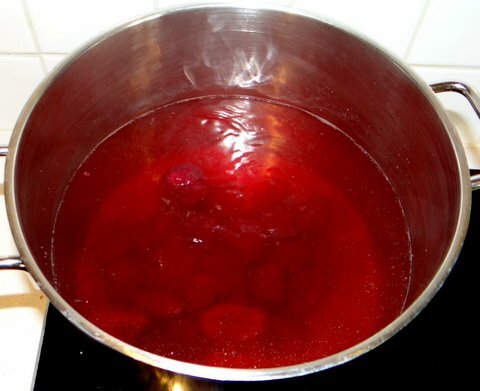 Wrap each beetroot into aluminum foil and cook them for 1 hour in an oven preheated to 200C/390F. Let the beetroot cool in the oven with the door closed for at least 3 hours. Remove the foil and the skin. 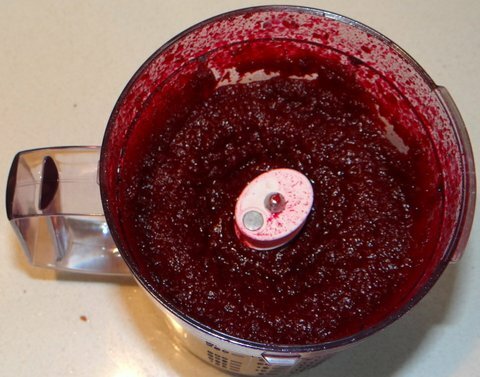 Process beetroot in a blender until smooth. 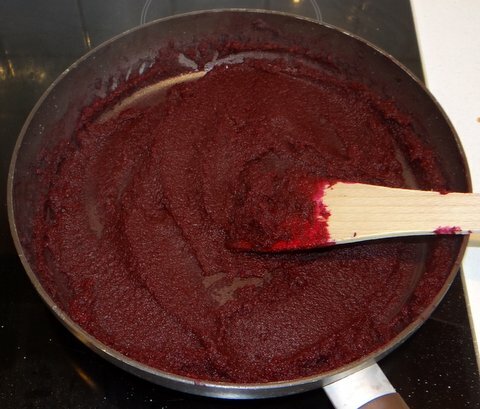 Cook beetroot in a non-stick frying pan over low heat for around 20 minutes until a lot of the moisture has evaporated and you have about half of the original weight left. 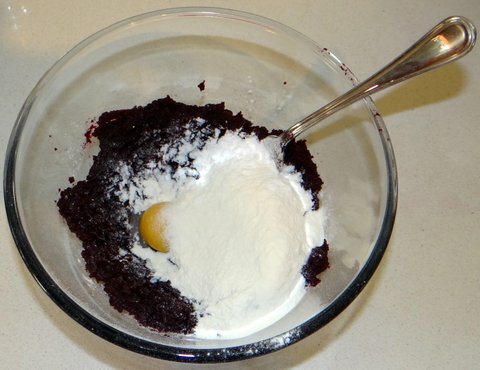 This step is needed to concentrate the flavor and to minimize the amount of flour needed (and thus maximize beetroot taste). 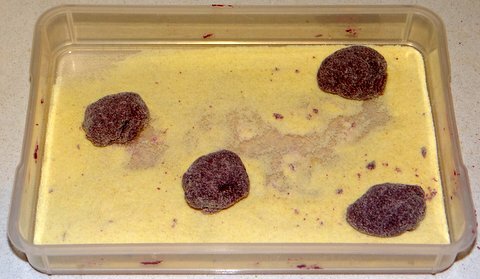 Put the beetroot puree in a bowl and spread it out to let it cool to less than 50C/120F or so (otherwise the egg yolk will be cooked). Add egg yolk, flour, potato starch, and salt. Mix with a fork. You should now have a mixture that is soft but not extremely sticky. But a layer of semolina flour in a container with edges. 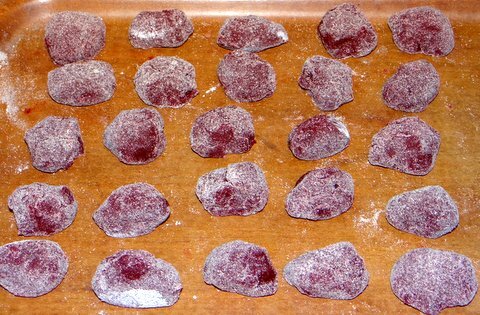 Use two teaspoons to scoop round gnocchi from the beetroot dough and drop them gently on the semolina flour. When you have added 4 to 6 gnocchi, gently shake the container to coat the gnocchi with semolina flour on all sides. Put the gnocchi on a tray. They will be soft, so handle them carefully. Repeat until you have used all of the beetroot dough. Cook the gnocchi is salted boiling water (that is boiling just gently). As soon as a gnocchi floats, transfer it to the sauce with a slotted spoon. I used a sauce made from butter, cream and gorgonzola. Toss the gnocchi gently to coat them with the sauce. Serve on preheated plates and sprinkle with freshly grated parmigiano reggiano. So pretty, Stefan; I love the deep purple color of your gnocchi. 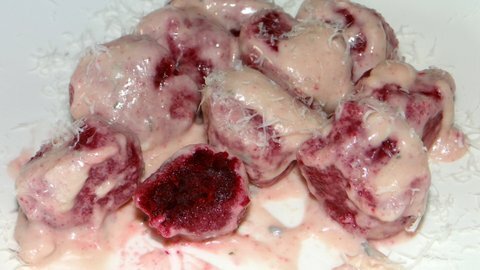 I recently saw beet croquettes on fine dining my way (http://sercocinera.wordpress.com/2013/01/17/goat-cheese-and-beetroot-croquetas-over-salmorejo-cordobes/) – now I feel that I may need to have a beet party soon.